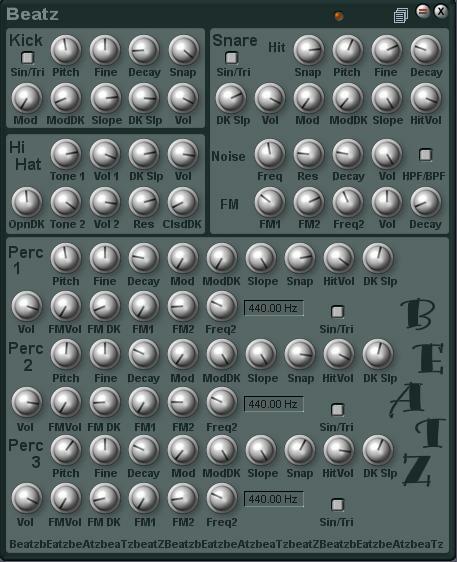 Higens Comment: After browsing the device section I came over Beatz synth, and by listening to the demo I got very excited! I haven’t had the time to install it my self yet! But I sure will! Ok, here’s the full release, lotsa controls for you to play with. Trigger notes are GM midi, percussion’s are on tom notes F1, G1 and A1. I had a pan control but figured it wasn’t that necessary and turned it into the DK Slope control because I had no room left to add it to the gui for the kick and hihat and I didn’t want to shift everything around. I’m sure most will use the separate outputs anyways so the pan is kind of useless. Previous Article← ADERN: KickMe Too!